Hookstrip flat screens are the series applied most widely at present. 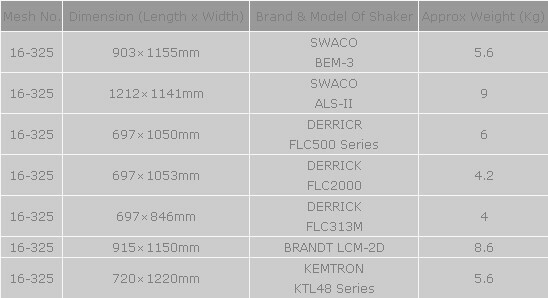 These products can be fit for all kinds of shale shakers. This screen panel is constructed with two or three stainless steel layers bonded to a steel support panel. With an acceptable fluids handling capacity, it is cheaper than the pyramid screen. The Hookstrip shaker screen has many advantages. Due to the difference in mesh number of the screen meshes, the user can get more excellent screening effect by using the screen meshes with rational and correct arrangement. 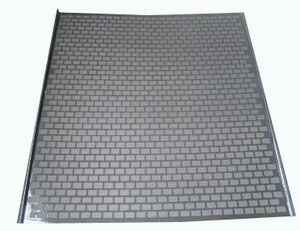 Features: Different layer with different density, To arrange these layers reasonablyand exactly,the screening effect will become more better. Screen with different mesh counts have suitable opening sizes of the backing plate . Doing so,our products will obtain the largest effective area under the condition of enough strength.The bottom layer with low mesh counts hs coarse wire, and can be tight bonded to the backing to make up one block .So the strength of whole screen mesh get up and the useful life is increased. The mesh divided into many independent small units by grids of the backing plate, can prevent rips or tears from spreading over much. Accessary prepared rubber stroppers can be used repair damages. By doing so, the operator can cut do wn the stop-tim and reduce the cost. On the basis of ensuring adequate strength, we strive to obtain the maximum effective area of the screen mesh. Meanwhile, the integration of the bottom coarse wire mesh with small mesh number and metal lining enhances the strength of the whole product and prolongs its lifetime effectively. The grid on the metal lining of the product divides the screen mesh into multiple independent small meshes, which can avoid local damage and excessive expansion. In addition, the product is furnished with special rubber plug which is used for repairing damage. This design can save time and reduce use cost. At present, Hook strip flat plate screen 15 one of them most used screens, and can be applied widely in different drilling conditions,it is usually composed of two or three atainless steel layers bonded hard to metal, holey, support backing plate.we possess the strong expirence and the ripe technology, and will provide various specifications of hook strip flat screen to serve the clients? demands. The mesh divided into many independent small units by grids of the backing plate, can prevent rips or tears from spreading over much. Accessary prepared rubber stroppers can be used repair damages. By doing so, the operator can cut do wn the stop-tim and reduce the cost. Shaker screen is important part for shale shaker and cleaner. OGEM can provide qualified shaker screen for Derrick shaker, NOV Brandt shaker, other brand shale shaker screen.